The debate rages on. 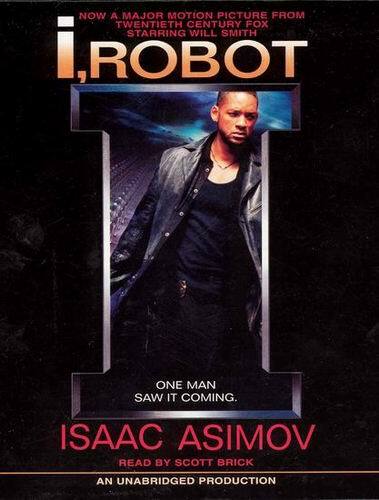 Most don’t know how much the film I, Robot (to be released in July) resembles Isaac Asimov’s original work. A badge-toting Will Smith gracing the cover of this audiobook suggests that the resemblence will be tenuous at best… many say that it doesn’t matter. 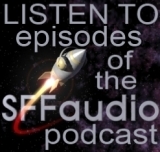 Whatever your opinion, the result for audiobook listeners is an excellent unabridged version of some classic SF. A small girl enjoys the family robot – a bit too much, according to her mother, who arranges its disappearance. On a manned expedition to Mercury, a robot named Speedy doesn’t return from an important mission. Unfortunately, Speedy’s mission is vital to the survival of the human crew. A robot believes the unbelievable – is it possible? A robot used for asteroid mining goes wrong, and U.S. Robots representative Gregory Powell is sent to make it right. Could be subtitled: The Mystery of the Mind-reading Robot. Susan Calvin is called in to solve a problem with a collection of robots – which one is lying and why? A supercomputer called “The Brain” is asked a question, and it answers. A prominent politician is accused of being a robot. The Machines take an even greater role in the affairs of humanity. The behavior of all of Asimov’s robots are governed by his famous Three Laws of Robotics (see them below), and the stories themselves are all about the effects of robots on humanity on both the personal and societal levels. These stories are excellent, intelligent, classic science fiction – some of the finest work by one of the finest science fiction writers ever – Isaac Asimov. Scott Brick, a narrator I always look forward to hearing, performs. He is engaging throughout and reads as if he truly enjoyed doing it. He’s one of the best. NOTE: For more unabridged Asimov, check out Books on Tape, where Scott Brick has narrated more of his titles. Asimov’s robot novels, the first two of which are The Caves of Steel and The Naked Sun have not been produced as audiobooks, as far as I know. A glaring omission! The BBC has produced an audio drama of The Caves of Steel, however.